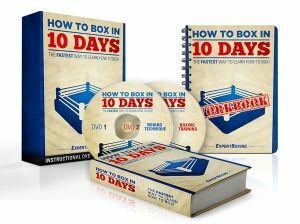 Learn how to bounce in-and-out like a REAL BOXER! You would think everyone would know how to bounce-step just from watching Muhammad Ali, but things don’t work that way. Like any other skill in boxing, it’s harder than it looks! Do you get tired easily when bouncing around? Is it hard for you to get in-and-out of your opponent’s range? Is it hard for you to stay balanced when moving? Is it hard for you to throw punches when moving? If you answered “YES” to any of the questions above, there’s a good chance your bounce-step could be a lot better. The REAL boxer’s bounce-step is relaxed, subtle, grounded, and slick! What is the Boxing Bounce Step? 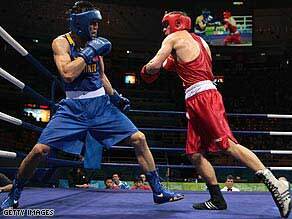 The bounce-step is a commonly used fighting footwork technique typically used in boxing as well as in other kinds of fighting styles. Unlike the basic “step-drag” which is taught to beginners to help them stay grounded and save energy, the bounce step allows the fighter to change directions quicker and can also be used to cover more distance, at the cost of using more energy. Executing the bounce-step requires a bit more skill as a fighter could easily exhaust himself if he lacks the ability to bounce efficiently, with good coordination and rhythm. The bounce-step could be certainly considered in some ways a similar skill to skipping rope. While a novice could easily get tired within a few jumps, a skilled fighter could easily bounce for many rounds without using much energy. 1. Try to “bounce” with both feet. The common mistake is to jump from one leg to the other, passing your body weight back and forth. The reason why this isn’t recommended is because it easily wears out your legs. It’s better to jump off both legs and land with both legs which would require you to keep your body weight relatively even between both legs. As you jump back and forth, the skill is to keep the weight distributions between the legs around 55/45 rather than 80/20 or even worse—100/0. Allowing both legs to share the stress of jumping AND landing would not only make the move far more energy-efficient but also allow you to change directions faster. increases speed and saves energy. 2. Bounce downwards, not upwards. The common mistake is to bounce upwards, which wastes leg energy pushing your hips upwards in a direction you don’t need to move, and then wasting more leg energy when your body impacts the ground again. As you can see, jumping UP will unnecessarily tax your legs twice because you’re moving your body up & down when what you really needed is to go BACK & FORTH (or IN & OUT). The other problem with jumping up and lifting your hips off the ground is that your body spends more time in the air disconnected from the ground and unable to throw punches with power. Bouncing with the intent to go “downwards” will keep your hips down and be more grounded, allowing you to change directions quicker faster and throw punches with more power, and also save energy in the process. And by bouncing “downwards”, I don’t mean that you try to lower your stance or bend your knees more…I mean for you to simply project the momentum of your body more downwards rather than upwards. The trick has to do with being able to relax your body to move, rather than to create tension. And in case you don’t know how to relax your body to move, I highly recommend for you to skip rope everyday. Do it for 10-15 minutes every single day as a warm-up. That is the best way to teach your body how to bounce efficiently. Do that exercise everyday and watch your boxing footwork jump to a whole other level. change directions quicker and throw punches with more power. The common mistake is to make big bounces, which wastes leg energy because you’re moving more than you have to. It takes more energy to bounce higher and farther, and then to land, and then to change directions and bounce again. Keeping your bounces small is what makes it easier to bounce with both feet, bounce downwards, and save energy. Many beginners usually make big bounces because they haven’t yet developed a refined sense of range. And so they end up jumping large distances to get in and out of range. This movement is completely unnecessarily and only wastes energy and slows them down. You won’t need to be so fast and cover so much ground once you find the line between out-of-range and in-range. The best tip I can you is to stay at the edge of your opponent’s reach. Place yourself just outside his range and this way, you will only need a small bounce to get in and a small bounce to get out. At the end of the day, the bounce footwork is to get you in and out. And the closer you stay to the edge-of-range, the less effort it will take you to go IN-&-OUT. It’s not about being fast or flashy. You move in, attack, and get out. That’s all there is to it. The less effort it takes you, the better. allows you to go IN-&-OUT with more speed and less effort. The bounce-step is the perfect move for changing directions quickly. This is useful in fighting when you want to quickly go in-&-out for hit-and-run tactics. It’s also useful for going side-to-side when you’re trying to use lateral movement to run away from a chasing opponent. Bounce steps would be unnecessary if you were trying to go only in one direction, such as going straight back or straight forward, or only to one side. If you’re only going in one direction, you may find more energy-efficiency or balance with other footwork techniques such as: the step-drag, or the shuffle, or even simply walking. The bounce-step is best used when you’re at the edge of your opponent’s range. 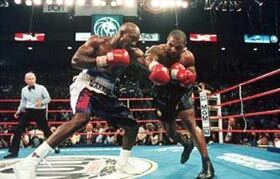 The ability (and energy required) to change directions quickly is perhaps most important when you are within range of your opponent’s punches. Being able to go change directions quickly gives you the most strategic benefit when you use it to go into range, land punches, and then quickly get out. Changing directions when you’re out of range doesn’t make any sense because you’re not in danger of getting attacked and you don’t need to use more energy than necessary. On the flip side, changing directions quickly when you’re up close on the inside also doesn’t make any sense because you’re so close that you won’t be able to move fast enough. If you’re fighting on the inside, I recommend fast head movement over fast footwork. 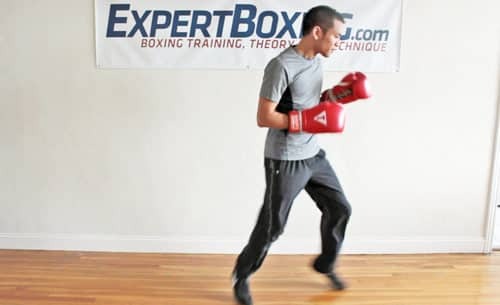 Learn how to get a real boxer’s bounce, a very skillful movement and often very misunderstood. The boxer’s bounce-step is a great fighting footwork movement that can be easily used throughout an entire fight if you know how to do it correctly. While many people think it’s all about bouncing up and down and back and forth using explosive leg power, this couldn’t be further from the truth. The real boxer’s bounce is actually very relaxed, subtle, stays low to the ground, very slick, and very fast! relaxed, subtle, grounded, and slick! Let your body twist back and forth with each bounce. It’s similar to walking where your arms move in the opposite direction of your legs (watch the video to get a visual on this). When you bounce with this kind of movement in mind, your body is more relaxed and moves better as your upper body balances out the lower body. The problem with not using contralateral movement is that your upper body remains stiff instead of relaxing. This causes you to end up shifting your weight from leg to leg as you bounce back and forth. As explained up above, this wears out your legs as your body weight shifts entirely to one leg on every bounce. By understanding the secret of using contralateral movement with your bounce-steps, you’ll find it much easier to relax and bounce off both your legs simultaneously. The important detail is to know that your body doesn’t have to LOOK like the upper body is moving on every bounce but to know that the body is relaxing in that way on the inside. Being able to relax and twist your body on the inside allows you to move much easier. as long as it’s relaxing and moving on the inside. 2. Keep your body weight at center. Once you’ve mastered the bounce-step using contralateral movement, you’ll find it’s much easier to stay balanced and keep your body weight at center as you jump back and forth. The ability to stay balanced using the upper body twist will allow you to jump off the center and land at the center. Again, this helps to improve the speed of your bounce-steps and save leg strength since both legs are doing the work simultaneously. saves energy by distributing the work between both legs. 3. Keep your body down. Learning how to use the contralateral twist will not only balance out your body and allow you to relax, but also make it much easier to keep your hips (and body) grounded. Being able to stay down while jumping can be one of the hardest things to master but it definitely helps you to stay down so that you can throw punches or change directions again when you need. The goal is to keep your hips and body down even when you “jump”. It’s even possible to keep your feet lightly touching the ground as you bounce back and forth. One of my favorite tips is to tell people to relax downwards as they jump. Try to feel like you’re relaxing as you bounce DOWN THE STAIRS, instead of using tension and muscle to bounce UP THE STAIRS. allows you to stay balanced and grounded. Good Day! 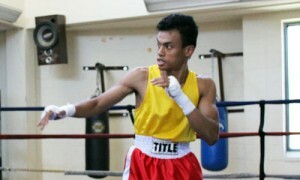 I am planning to compete in our inter gym competition this May, (Elorder Gym). What is the best training plan? When should I increase my training? I’ve started boxing last October. I train trice a week, I do running, plyometric exercises and ultimate frisbee in between. Don’t have much sparring. Hope you can help me with some pointers. *Most of the contestants are beginners and advanced. I weigh 140 lbs, my height is 5 feet 7 inches. 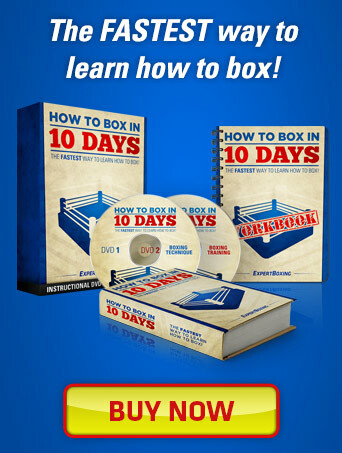 Check out my “EASY Boxing Workout” and adjust what you need. I prefer a double mouthguard. Pros and cons? It’s really personal preference and the way each individual’s jaw is built. Basically you want good protection that is comfortable, doesn’t make you feel like your jaw is too open and doesn’t make you salivate like crazy or uncomfortable in other ways. Thank you Johnny, have a great day! Double mouth guard is for football players mostly. Stick to the single one. I don’t agree with this and it really depends on the individual’s preference. Some people need/want more, some people need/want less. There’s no one-size-fits-all when it comes to mouthguards especially with the way how everyone’s jaws are built differently. Johnny, thank you for this article! Lately I’ve been having trouble with my lower legs (too much off balance bouncing). The video about contra lateral movement really woke me up and made me rethink my rope jumping. I train in dutch thai boxing, so I’m exposed to a heavy dose of the sweet science on a regular basis. Your articles and videos are fantastic, keep ’em coming! It sounds like you’ve figured something out, Zach. I hope it does the trick for you. This is great Johnny, it’s something I’ve thought about for years, and you simplified it for me into one sentence when you said to ‘bounce downwards not upwards’! Yes…bounce DOWN the stairs, not up. It’s a big one. Congratulations on your new team position! I wish you guys the best of luck. Keep pushing them, Kamran. I think your web site and your videos in the youtube is number 1!! Good personality, Awesome trainer and boxer. hey, this was nice, thanks. But it is a little confusing about bouncing ‘down’. It looks like your hips are staying at about the same height, so the air you get is mainly the leg movement–is that right? Here’s another way to look at it, Tim. You want to spend as little time as possible off the ground. You’re not necessarily jumping off the ground, but into the ground. This may also be of some help to you. (If not, please disregard!) There was something I learned back in my track-and-field days. Which is when it comes to jumping the hurdle, you want to jump as low as possible. Whoever jumped the highest spent too much time in the air, which slowed them down. The guys who jumped the lowest, or even didn’t jump at all (they simply “ran” over the hurdle), were able to move faster because their feet hit the ground sooner and continued pulling them along the track. The difference though…is that with track-and-field, you exert tons of force all the time. With the boxer’s bounce, you want to do it while relaxing. It’s hard to figure out but it’s very possible and very commonly done by the skilled fighters. Thanks for making a great article on “Bounce Step”. I have been wondering why do i always get tired easily when i do that ,it burns me out really fast after a round or two in a fast pace of light sparring.But now i am able to know how to utilize all my energy thanks to your different article.I’m a beginner and just started out trying boxing. Can u give me advice on how to become more flexible in the legs? i’m been doing stretching exercise for around 2 months for my legs but it doesn’t seem to work.Normally i will jog for 8-10km 3 times a week and after it’s done i will do my stretching for cool down.but i still find it hard to stretch even though my muscles is warm up after the jog.i have a flexible upper body but a stiff lower body.Which make me can’t use the full range or movement without using big efforts in boxing. Hi Ben, it sounds like you have the same problems I did. Are you doing static stretching or dynamic stretching? Try dynamic stretching. You can also look up somatic exercises for stretching. Also try yoga. Those are some great options right there. Hi Johnny, thanks for your advice,and it work out Great! after weeks i can feel some improvement in my legs. I have a question to clarify, i understand that i need to have a short bust in order to get a explosive step in, but sometime it work and sometime it doesn’t. Does explosive step in required lots of strength in your legs muscle in order to do it or is it base on form with speed? i find it hard to capture the correct form without losing my balance when i stop immediately. And sometimes i will hurt my knee when i stop immediately as i can feel the stress in my knee when i do that repeatedly. I not sure if there’s are any technique to perform it? If heavy steps are bad and small light steps are good, does that mean you should try to step as if your trying to be as slient as possible? almost like a stealthy ninja? Don’t worry about being loud or soft. Move quickly using the least effort possible. If you want to be really particular, it’s heavy but relaxed and relatively quiet. But the “heavyness” is not in terms of sound or in the amount of impact force but rather the way your body feels internally. I want to know if pull-ups are good for boxing. If yes, in what way ? Pull-ups work many of your upper body muscles. They increase your upper body strength. youtu.be/qSX0PCQXiO4 Was wondering if you could watch this video and see what you think about it? Even write an article on basic head movements? Hi Tuan, I already have several articles and videos out on boxing head movement. Check them out! As for the video…he’s using head movement against untrained fighters and not surprisingly…it works. But against trained boxers/fighters, you’ll probably have to be a bit more refined than that. exactly. i waited for johnny b4 commenting lol. the guy misled the amount of ppl who clicked “like.” glad johnny thought so too. his head movement is worse than the infighter weave, worse than the evasive fighters’, and just plain RANDOM which totally explains why he got pwned. there is not even a need for a guide on that video. the guy took the slip and step back you learn in the beginner’s, the U-shape duck and lean back from the intermediate, and tried to convince the world to mash them together RANDOMLY for huge success. He’s a genius to put the clip of him getting pummeled along with the rest lol. Oh and the comment that exposed him seems to have been deleted. At least I went as far back as 2 months and that comment is gone. no wonder those 1420 dislikers were so silent. I find your articles highly in-depth and I love reading them so I thought I’d ask for some advice in regards to good boxing footage. Lately I’ve been doing a lot of sparring and I’m really starting to enjoy it because I’ve gotten over the flinch hump and am starting to actually land some punches. I’m beginning to fall into a fighting style that works well for me, which is a heavy utilization of the rear slip (basically a backwards lean). I like to come forward low with a dipping jab to bait my opponent into throwing, and once he does, I’ll immediately lean back onto my rear leg and throw a counter cross while slipping to the left (orthodox stance). I’ve landed most of my right hands that way. Another combination that tends to work well is a left hook thrown with a slight jump to his outside and a cross right down his centerline. Now the reason I’m telling you this is because I want to study some boxing footage to learn more about what I can do to play off my strengths. I don’t have any official instruction going on right now, so I’ve really just been browsing the web for technique and sparring whoever I can to get better (literally whoever – fought a guy with a hundred pounds on me a couple days ago. Boy, did that go surprisingly not too badly), and I feel like studying high-level footage could get me a lot farther. Professional boxing isn’t a sport I really follow, so do you know any fighters who have similar styles I could study? I would like to see an example of that left hook with a hop (to the outside). I’ve seen hopping/leaping left hooks before but can you explain how you are hopping to the outside? Thanks. It’s basically a leaping left hook, except that instead of jumping straight forward, I jump diagonally to the left, placing myself outside of my opponent’s right hand. I’ll set it up like a normal hook, but the weight transfer and body rotation is done in midair. My right foot will travel in a slight arc, almost like a pivoting left hook, as my left foot comes forward. Throwing the hook this way sets up the cross pretty well as I get the angle required to throw straight down the centerline between their hands. Got it, thanks. I could post some suggestions for you to watch while you wait for Johnny’s reply because it sounds similar to my 2 favourite left hook fighters’ punches. I think it’s different than Floyd Patterson’s infamous punch but studying. 0:46 is right when the knockout segment starts and not surprisingly right when he showcases his infamous punch. Most knockouts are from his signature punch or a variation of it. The one that is closer to your description would definitely be Roy Jones Jr. (imo). 7:30 is the lead left hook he’s been using all fight landing a KO. Another devastating one is from a sanda fighter said to be a former shaolin monk. He leads with his left hook like it was his jab and he doesn’t move outside his opponent during the punch nor duck low before the punch nor leap in the air. He pulls it off though and it hits like a brick every time it hits. However, he doesn’t fight in boxing. Matt…your best bet is probably to watch amateur boxing, look up videos of local amateur fights and Golden Gloves bouts. Pro boxers do use the methods you shared but they do them so much subtlety that it’d be hard for your untrained eye to see. The best option really is to go to a gym and see these things in person with your naked eye. You’ll see and learn so much more this way. Hey Johnny in your opinion what are good street material arts like Krav Maga, keysi, etc to effectively combine with boxing? I really wouldn’t know, Joe, as I consider myself only a pure boxer. I imagine Muay Thai, judo, wrestling, and BJJ are good options. Krav Maga might be good too but I don’t know if they have a developed competition environment which is especially helpful for evolving and refining the techniques. It’s not necessarily the movement but the concept of not lifting off. You can apply it to different footwork. The thing is the really skilled guys have mastered the technique of “relaxed bounce footwork” so well that they can use it to cover large distances. Watch Pacquiao shadowboxing and you will see that his “lunges” are actually relaxed drop-steps. You can see that the way he shifts around the ground is very fast and sharp/slick and not the typical newbie leg-push. It helps me for preparing Bounce Step. but i have some difficulties. May i have your advice? Your tip is really helpful and precious. First, my calf and ankle(especially right) get tired quickly. If I exercise bounce step for one round, I can’t continue and have to relax. Second, when i jump, I use mostly ankles. It’s not easy to use knees. I guess this is why i get tired quickly. I think i may use my knees for step, but those around me say I don’t use knees. Bending knees much is helpful? Third, While i exercise bounce step on the spot , Sometimes only leg moves but body is still. Do I have to move both upper body and lower body simultaneously? How can i move both simultaneously? 1) Start jumping rope more often to develop endurance and efficiency for bounce step footwork. 2) I agree with the others…use your ankles more. You should bend your knees, but bend it as little as possible. Another way I would say it is to relax the knees and nothing more. The problem with bending so much is that it wears out your legs quickly. 3) Both move simultaneously or else it will feel weird. The goal is to bounce as low as possible…don’t come off the ground so much. Hey Johnny will you ever write a guide on walkin footwork please? Yes, Randy. That will be in the works at some point. That’s an advantage if you can actually pull it off. The thing is for beginners, it’s better to quickly evolve from your best side as soon as possible. 1 guy training 10 hours from one side is probably gonna beat the guy training 5 hours from 2 different sides. You decide which one you want to be. I’ve just started boxing about a month ago. I’m 6’3 and 270 pounds! I’d love to utilise the bounce step technique but I’m not sure whether I’m just too big for it? I’m a southpaw and being half Filipino I idolise Pacquiao’s footwork and punch technique, so that’s why I’d like to master this bounce step. But am I just too big for this style? Also I’ve read all articles you’ve wrote about southpaws and Pacquiao’s 10 tricks! Trying to absorb everything! Also, are you Filipino at all? Just wondering. Johnny you’re the man! Thanks a lot for this very helpful article! It was hard for me to explain to my girl friend how to do “bounce”. So, thank you for this!